In diabetes, calf or leg pain can be due to diabetic peripheral neuropathy (DPN), to peripheral artery disease (PAD) or to deep vein thrombosis (DVT). All of these conditions can result in pain, cramping, achiness and swelling in the calves and the lower leg, ankle and feet. And all of them can be associated with severe diabetic foot problems including ulcers, infections and weakened bones that can lead to fractures. 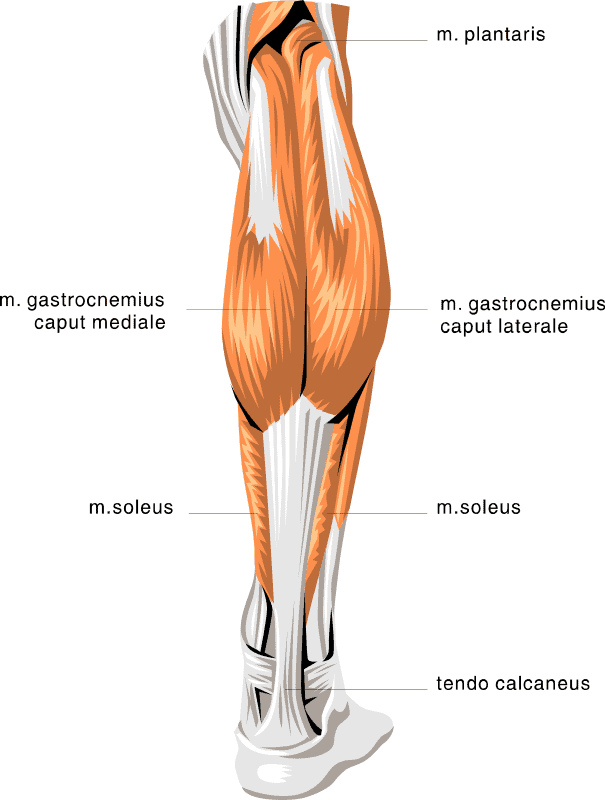 The pain in the calf can be in the gastrocnemius muscles (often shortened to “the gastrocs”) or to the soleus or plantaris muscles. DPN results from nerve damage, primarily in the feet and legs, but sometimes also in the hands and arms. One of the main causes of DPN, it is believed, is the accumulating toxic effect of high levels of sugar on the nerves and surrounding tissue. The high levels of sugar can be toxic on their own some believe, but in addition, high levels of sugar can increase the levels of substances called free radicals. Free radicals are naturally produced in the body as a result of normal reactions. The body also has naturally occurring antioxidants, primarily enzymes such as the selenoproteins (proteins with the trace mineral selenium), sulfur-based proteins such as glutathione, Vitamin C, Vitamin A, beta carotenes and Vitamin E (which humans need to get through the diet) and others. These natural antioxidants can however, be overwhelmed by the high levels of free radical which may be produced by cells bathed in high levels of sugar. This can eventually lead to a condition in the cells called “oxidative stress” and it is this damage—caused by high levels of free radicals which damage the cell’s DNA and the proteins in the cells which can damage nerve cells and result in DPN. Peripheral artery disease is a common complication in diabetic patients—estimates are that at least 20% of individuals with diabetes have symptoms of PAD. The number of people with PAD is probably higher because PAD often (about half the time) does not have clear symptoms. PAD is the result of blockage of arteries with atherosclerotic plaques. These plaques are also associated with high blood lipids (fats) and high blood pressure, also quite common conditions in people with diabetes. PAD is also strongly associated with smoking. Intermittent claudication: this is defined as pain, achiness or cramping in the calves, thighs or buttocks. The pain, cramping or aching generally appears with walking and disappears at rest. Intermittent claudication can progress to pain, cramping or achiness at rest, loss of muscle and other tissue because of the lack of oxygen and other nutrients. This condition is known as critical limb ischemia (CLI) and can lead to foot or leg amputation. PAD can be diagnosed—but it can often be difficult, since the symptoms of PAD are often silent. PAD is usually diagnosed by a careful history, determining if there are any signs of intermittent claudication, evaluation of pulses at the legs and feet, any evidence of poor circulation such as loss of hair growth, poor growth of toenails, skin problems suggesting poor blood flow, redness in certain areas of the skin, and either paleness when standing or a drop in blood pressure (orthostatic hypotension) when standing. Other tests include a measurement of the ankle-brachial index (ABI)—this measures blood pressure at the brachial artery (as is normally done to measure blood pressure) and at the ankle—this can give the physician significant information as to how well the blood is reaching the lower legs. In addition, specialized vascular labs can perform tests to see if any specific blockage in the blood vessels can be located. Other tests that may be performed include treadmill testing—to see if exercise induces either a decrease in blood flow, blood pressure of pain; studies to determine the level of oxygen in the tissues; various imaging tests such as ultrasound (US), a magnetic resonance angiogram (MRA) or an X-ray angiography may be ordered to visualize the condition of the arteries. Individuals with diabetes are at a higher risk for peripheral neuropathy and PAD—these risks increase with age and how long a person has had diabetes. Having DPN increases the risk of PAD and having PAD increases the risk of DPN. To make matters even more complicated, diabetes increases the risk of blood clots and Deep Vein Thrombosis or DVT.3 This condition can also cause pain in the calf along with swelling, redness, warmth and aching. US and a D-dimer blood test can be used to diagnose DVTs. Venograms are tests where a dye is injected into the veins and X-rays are used to see where the blood clot is located. The risk of DVTs also increase with age and how long a person has had diabetes. The risk of DVTs also increase with increasing weight, other inflammatory conditions such as rheumatoid arthritis, a lifestyle which includes too much sitting and not enough physical exercise—and long plane flights. Women who are pregnant or using oral birth control are also at a greater risk of DVTs. One of the more serious risks of DVTs are pulmonary embolisms where a piece of the blood clot in the leg gets broken off and travels by the bloodstream and into the main artery around the lung—this can prevent blood flow to the lung and can be fatal. DPN, PAD and DVT are all directly related to diabetes. The peripheral neuropathy appears to be directly related to high blood sugar levels while PAD is related to high blood fats, high blood pressure and possibly the high blood sugar levels. The DVT is related to the inflammatory nature of diabetes (likely because of the high blood sugar levels) and to the increased chance of clots forming due, at least in part, to the chronic inflammation of diabetes. All these conditions can result in calf pain. The most single important approach to prevent DPN, PAD and to DVT is to maintain your blood sugar goals. This means monitoring your blood sugar levels, sticking to your dietary requirements, keeping physically active and taking your medications or insulin as needed. Medically, DPN is treated with pain medication or anti-depressants. It is not quite clear how the antidepressants work, but you should know that you don’t need to be in clinical depression to benefit from these medications. The medications include dextromethorphan, morphine sulfate, tramadol (Ultram, ConZip, Ryzolt), oxycodone (Oxycontin, Roxicodone, Oxecta), gabapentin (Neurontin, Gralise, Horizant), pregabalin (Lyrica) or others. PAD is treated by maintaining a healthy diet, smoking cessation, cholesterol lowering drugs such as statin, antiplatelet drugs, medications to lower blood lipids (fats) such as fibrates including fenofibrate (Tricor). DVTs are treated with anticoagulants (blood thinners) such as warfarin (Coumadin), heparin, rivaroxaban (Xarelto), dabigatran (Pradaxa) or antiplatelet drugs such as clopidogrel (Plavix), prasugrel (Effient) or aspirin. The anticoagulants prevent the proteins in the clotting mechanism to act, preventing clots while the anti-platelet medications prevent platelets—tiny fragments of cells—from clumping together, a necessary step in forming a blood clot. All these drugs do carry various risks of side effects however—check with your doctor or pharmacist to determine the potential side effects of these medications. There are a number of approaches beyond the dietary, lifestyle and medication approaches to preventing DPN, PAD and DVTs. There are supplements that have been shown to be beneficial and useful in preventing these conditions. These will not replace following dietary and other lifestyle modifications and they may not replace any medications that you are taking. In addition, you should always share with your healthcare team any and all supplements that you are using—they can interact with many different medications. However, all the supplements mentioned here can improve your overall health and well-being and can help prevent complications such as DPN, PAD and DVTs. Always make certain to use supplements tested at independent labs such as the USP or Consumer Labs. Magnesium is an essential mineral and necessary for the function of hundreds of biochemical reaction in the body. Magnesium deficiency has been associated with an increased risk of all forms of diabetes, heart disease, high blood pressure and osteoporosis and has been shown to improve the sensitivity of cells to insulin. Magnesium has a large number of important functions in the body, but specifically, it is an important mineral in muscle function—one effect of low magnesium levels are muscle spasms and tremor. Magnesium can be taken orally (usually at about 300-600mg/day—higher doses are used to treat constipation, so diarrhea can result) or it can be applied as “magnesium oil” directly onto painful calf muscles. Magnesium oil can dry the skin and should not be used on any areas with open cuts—it will sting because even though it is in an oil, it is very much like “rubbing salt into a wound” After applying magnesium oil, apply a skin moisturizer so that the skin doesn’t dry or crack. Calcium is needed for strong bones and teeth. However, calcium is also one of the main minerals involved in nerve transmission, functioning of the immune system, and the regulation of blood pressure and blood clotting. It is also critical for muscle contraction and relaxation. Low calcium levels can also cause cramps, and at very low levels, tetany (sustained cramps). Calcium also needs Vitamin D to function and there are some supplements which contain calcium, magnesium and Vitamin D. The dose of calcium is usually 600-1200mg/day, though it will depend on the specific composition of the supplement. Alpha lipoic acid (ALA) is an antioxidant and can help protect against oxidative stress. In addition to having antioxidant properties itself, ALA can stimulate the synthesis of one of the body’s main antioxidant, glutathione. Studies have indicated that ALA can be used to prevent DPN—in Germany, ALA is licensed to treat DPN. 600 mg/day has been shown to improve the symptoms of DPN. Thiamin is a B-vitamin and has been shown to decrease the damage of high blood sugar levels on the nerves and the blood vessels in lab animals. In a human study, high dose thiamin (300 mg/day) was associated with better overall vascular health as measure by specific cell biomarker. Mesoglycan is a substance obtained from animals and is used to treat both PAD and DVTs. It has been shown to reduce leg pain as well. It increases blood flow and inhibits the formation of blood clots. A common dosage is 100mg twice a day. Omega-3 Fish Oils are anti-inflammatory, lower the fats in the blood (as tested in individuals with diabetes) and lowered the risk of some forms of heart disease. A commonly recommended dose is 1500-2000 mg of EPA+ DHA daily. Calf pain can be crippling but I hope this piece helped you understand how to cope with it. Johnson, Richard J., et al. “Sugar, uric acid, and the etiology of diabetes and obesity.” Diabetes 62.10 (2013): 3307-3315. Santo SS, Sergio N, Luigi DP, et al. Effect of PLC on functional parameters and oxidative profile in type 2 diabetes-associated PAD. Diabetes Res Clin Pract. 2006;72(3):231-237. Antonella Tufano, Claudia Arturo, Ernesto Cimino, et al., “Mesoglycan: Clinical Evidences for Use in Vascular Diseases,” International Journal of Vascular Medicine, vol. 2010, Article ID 390643, 8 pages, 2010. Hartweg J, Farmer AJ, Holman RR, Neil A. Potential impact of omega-3 treatment on cardiovascular disease in type 2 diabetes. Curr Opin Lipidol. 2009;20(1):30-38.